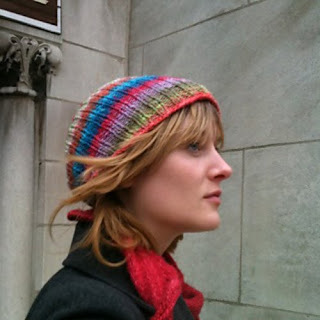 This is a very simple, top-down ribbed hat that can be made as slouchy or as un-slouchy as you want. Fold up the edge, and you have a cozy beanie. Fold only the bottom, and you have a luxurious slouchy cap. Fortunately for all of us, I wrote the pattern down as I knit it, and came up with a very simple design. Materials: about 130 yards of any light worsted or dk yarn. For more memory, go with a wool yarn, but when tightly knit, cotton and silk work as well. Important: Check your gauge because I personally have a very loose one. Aya recommends needle sizes between 5 and 7.
m1R: Insert your left needle, from the front, under the yarn between the needles, making a new stitch. Knit that stitch through the back loop. m1L: Insert your left needle, from the back, under the yarn between the needles, making a new stitch. Knit that stitch. With your dpns, cast on 8 stitches. Divide between 4 needles and join in the round. Knit the first round. Round 2: knit the front and the back of every stitch (kfb). When necessary, switch to 16" circulars, marking the start of the round with a marker. When finished with the increases, feel free to remove the marker and simply work in a 2x2 rib. 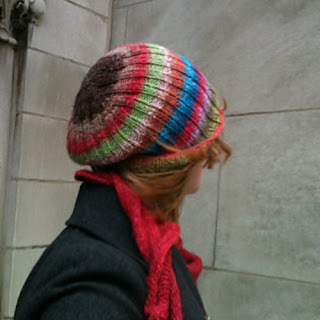 Continue until your hat measures 9" from the top, or until desired length. Trust me that if your hat is much longer, it may look kind of silly. Block very lightly, and weave in ends. I made a shawl out of it earlier this year and it turned out super mossy looking and gorgeous! just wanted to let you know! LOVE IT! I'm going to try it. Is it up on Ravelry? Tas--Thanks! It was on closeout, so I got a couple skeins--it looks perfect for a shawl design I'm working on! ColorSlut--Yep! Although the link will only bring you back to this blog post!